Game Preview: Barrie Colts @ London Kinghts. #OHL - Very Barrie Colts | A website covering the Barrie Colts of the OHL. Tonight the Barrie Colts are at the Bud-Weis-Er Gardens to face the London Knights for the last of two meetings this season. London beat Barrie in the first meeting 3-1. Colts were very undisciplined in the game serving 12 minor penalties. Amazingly, they only let in a pair of goals over those PK's. 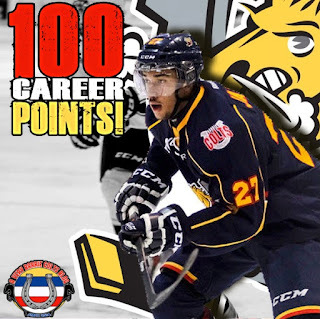 The Colts lone goal went to Mr. 100 points, Cordell James. David Ovsjannikov got the start that night and made 35 saves on 38 shots faced. Despite the loss, James and Ovsjannikov both were stars of the game. James went 21 for 32 in the face-off circle. The rest of the team made up for just 8 wins combined. Barrie was at home last night against the Hamilton Bulldogs and just managed to hold on to a 6-5 win. After the 1st period, the Colts were up 6-1. First period saw them out-shoot the Bulldogs 20-5 but over the next two periods Hamilton out-shot them 23-18. Hamilton put up 4 goals but the Colts managed to get the much win. Ovsjannikov made some big saves and saved 23 of 28 shots faced. Kade Landry had a huge game for the Colts with 3 assists. Colts who scored were Lucas Chiodo, Matt Brassard, Anthony Stefano, Ben Hawerchuk, Jason Willms and Justin Murray ended up with the game winner. 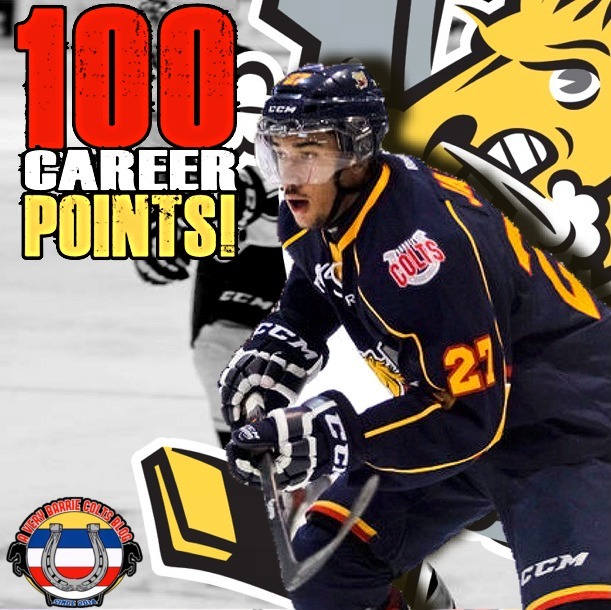 Colts captain Cordell James earned a pair assists which saw him hit a milestone with 100 career OHL points! Congratulations, Captain! The Colts win expanded their points in a game streak to 2.. Small victory but the team needs it. The game wasn't that clean. Late, Colts blue liner Matt Brassard took a pretty nasty spear from Niki Petti. Here is a look if you missed it. Petti was given a match penalty on the play. Keys to Success: I think for the Colts to get a big W tonight they will need a similar game to Owen Sound the other night. They will need solid goaltending. With Ovsjannikov starting last night you can assume Christian Propp will get the start tonight. They will also need to be good on special teams while trying to play a disciplined game. You no, nothing like the 12 minors they took last time they met the Knights. Players to Watch: Cliff Pu was kept off the scoresheet against the Attack. Before that, he went 18 straight games with at least a point and has only been held scoreless in two games this season. I would look for him to come out strong tonight. He currently is 5th for points in the OHL with 39 points on the season and his 16 goals are 5th most in the league. Puck drop is scheduled for 7:30 at that beer arena.